Shifty Saddled Up And Ready To Go! 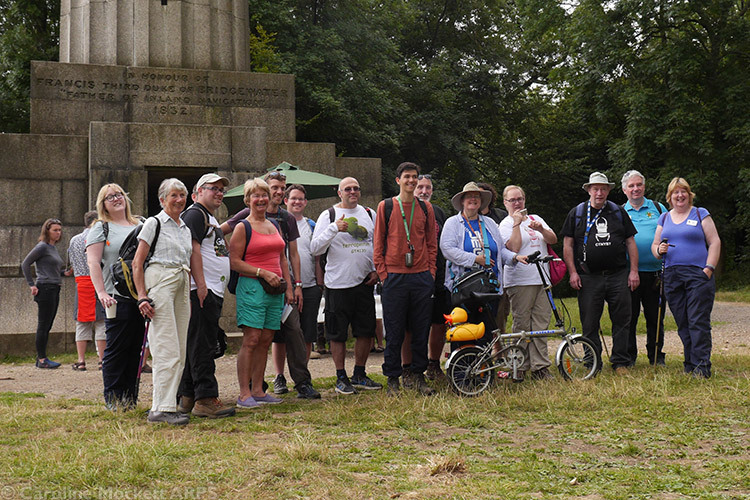 Today it was time to head to Ashridge Estate to attend the Geolympix 2016, my second Mega event. 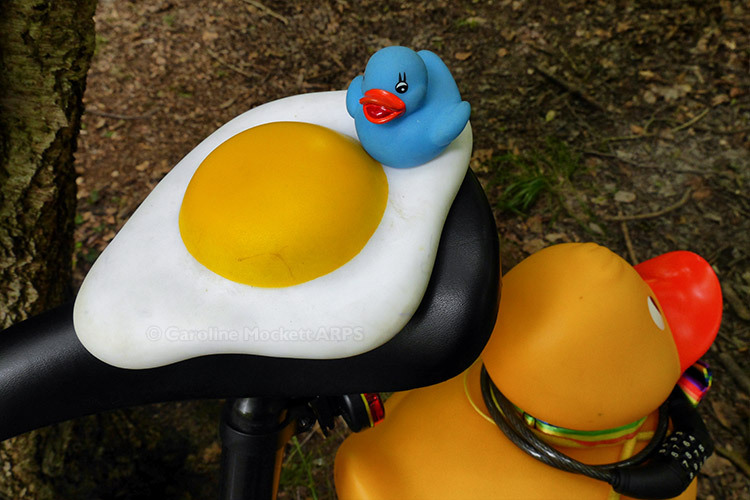 I was delighted to test out the geo-bike properly. 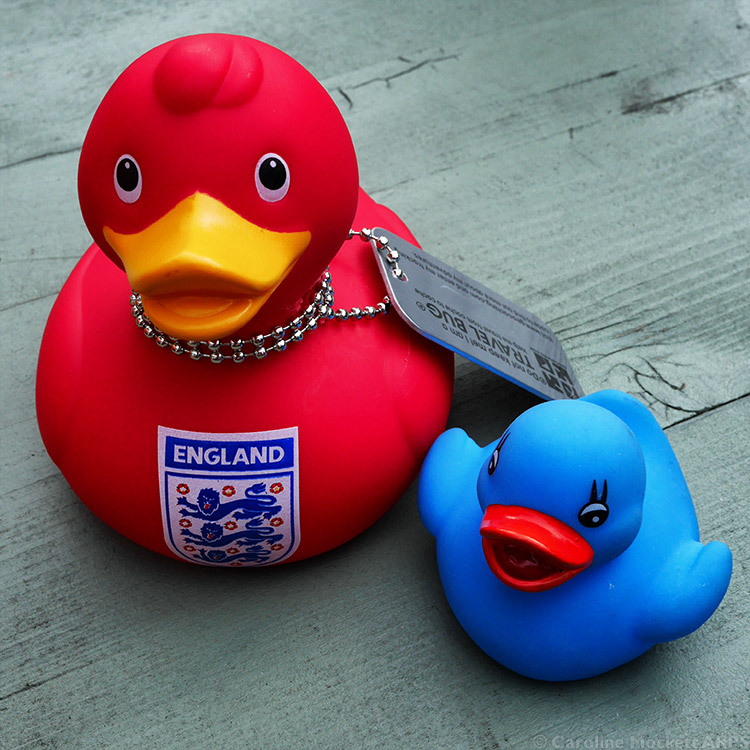 Ashridge is a big estate and it enabled me (and Shifty Duck!) 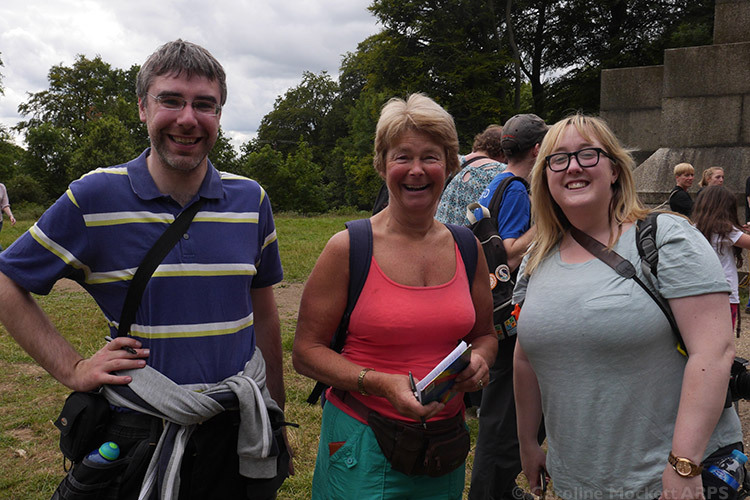 to get around and find a good few more caches than we would have managed on foot alone. Shifty bagged the jump seat pretty quickly – and certainly turned a few heads as we rode along! 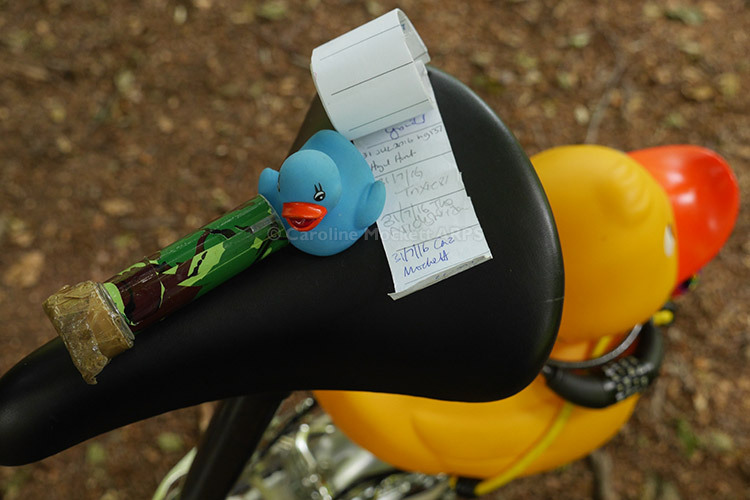 Little Quacker was also keen to help out with the finds and signing the log! 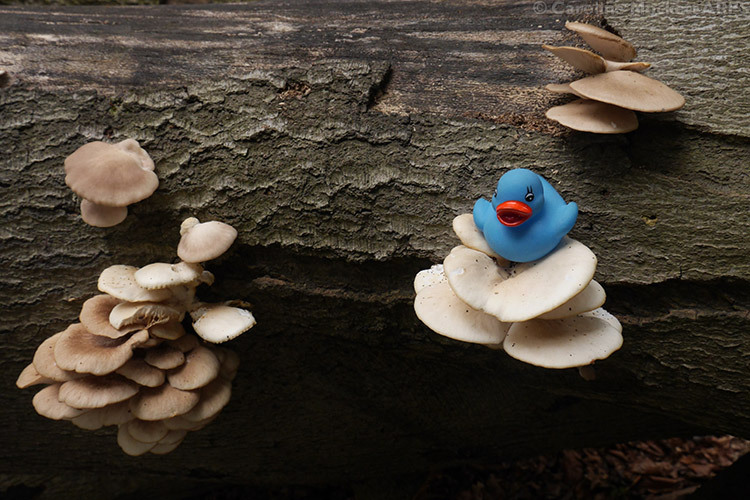 We found some interesting fungi in the woods too. 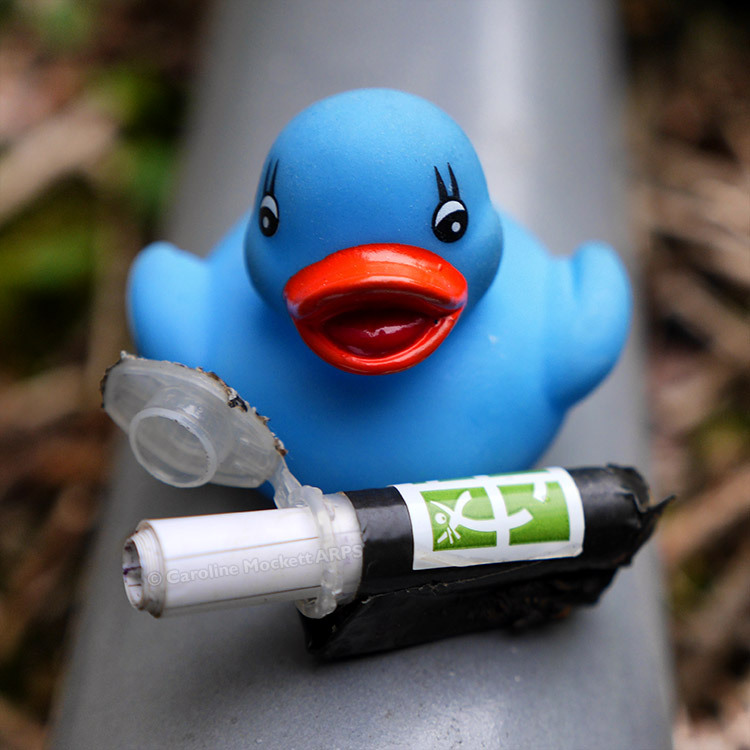 The birds were a bit worried about the camo for this cache! 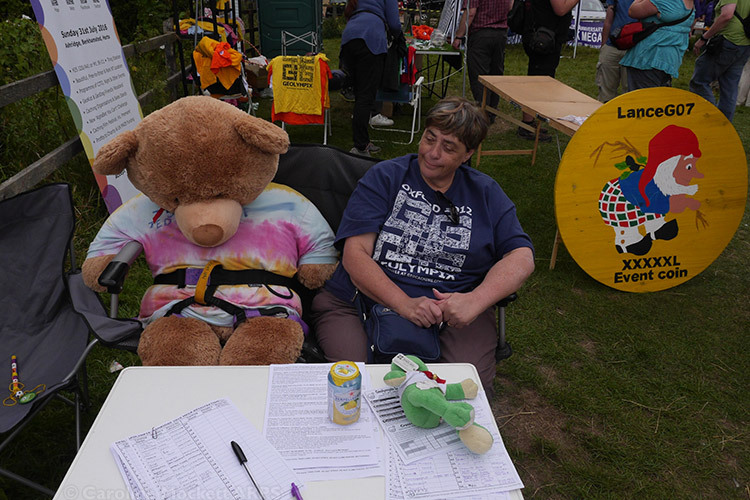 If I was worried that Shifty would be the biggest kid on the block, I needn’t have – look at this monster bear who was helping out on the Mega sign-in desk! 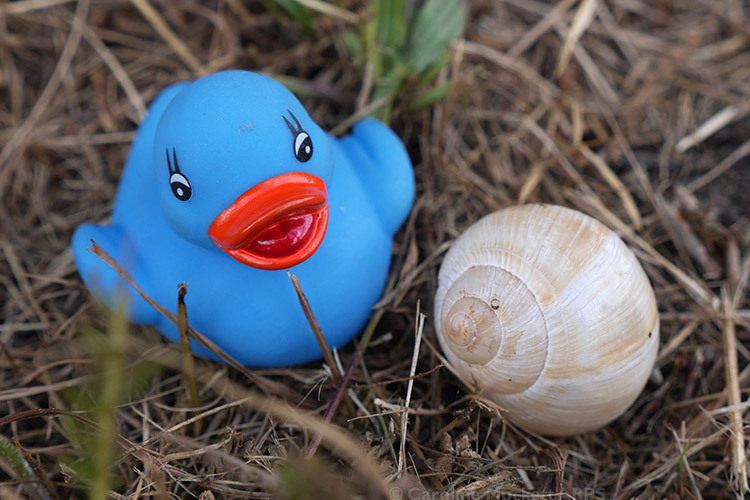 At 2pm the participants of #UKGeocachingHour on Twitter got together for a little meet up. It was well attended! Nice to meet folks in person who I’ve only chatted with online before now. Three Irish cachers turned up for the meetup – The_Chris, lulybelle and Saramur – great to meet them too, I’ve been chatting with Susan (lulybelle) and Sarah for ages, so lovely to put faces to names. 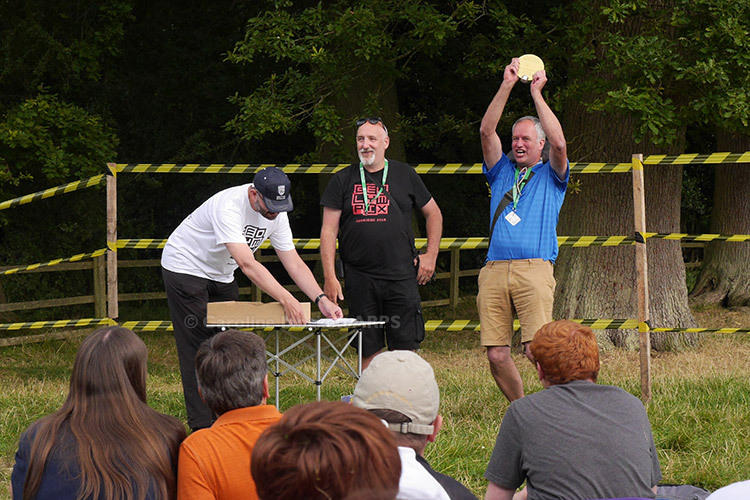 After riding around looking for a few more caches, I returned to the main site to have a rest and watch the National Geocaching Awards – there were some worthy winners – some of whom seemed particularly ecstatic to have won! I then made my way to the Travelodge in Hemel Hempstead for the night, so that I would be ready to set off again, bright and early tomorrow, for day two of my trip. I love my mountain bike, it’s great for going places close to home. But it’s rather a faff if I want to take it any distance in the car and then ride. 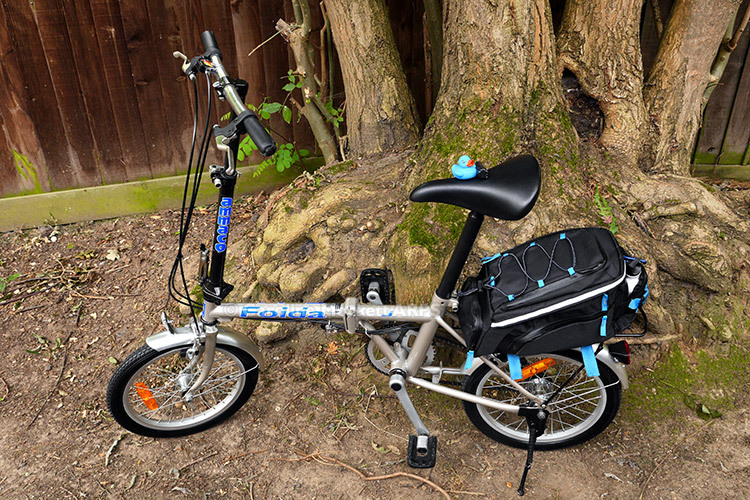 So I’ve invested in a second-hand folding bike, won a couple of days ago on eBay – I went to collect it this morning from a guy in Springfield! I thought I should give it a spin to test it out, so I parked a little bit away from the handily-named Chelmer Village Cycle Path hide, unfolded the machine and set off. Thankfully, it was a quick find just before the path became infested with muggles from all directions! After a break back home, I went out again this evening to look for a few hides around King George’s Park in Brentwood. 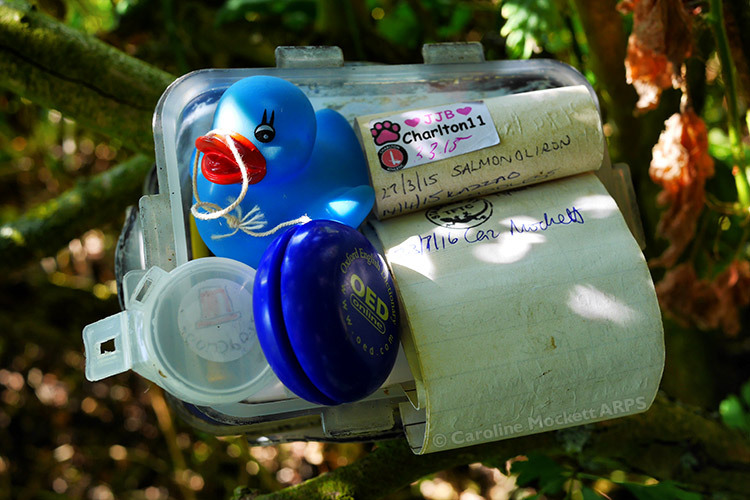 One was supposed to be a clever cache up a tree, with a line and counter-weight, but it was in rather a sorry state – the two previous finders today have already logged a Needs Maintenance, so I saw no point in adding another one. 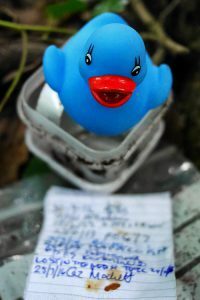 Still, even in that state, the find earned me my first August souvenir (for finding a cache with ten or more favourite points). A very lazy day today, partly due to being rather sore after falling off my scooter yesterday. But also because I had to sit at the computer and get stuff done. By the evening I was wanting a trip out, to I headed over to Maldon to try and clear up the final couple of unfound caches there. The first was a very quick find – finally – at a nemesis cache which I have already DNF’d TWICE! No idea why, since it was as plain as day when I arrived at GZ this time. C’est la vie. 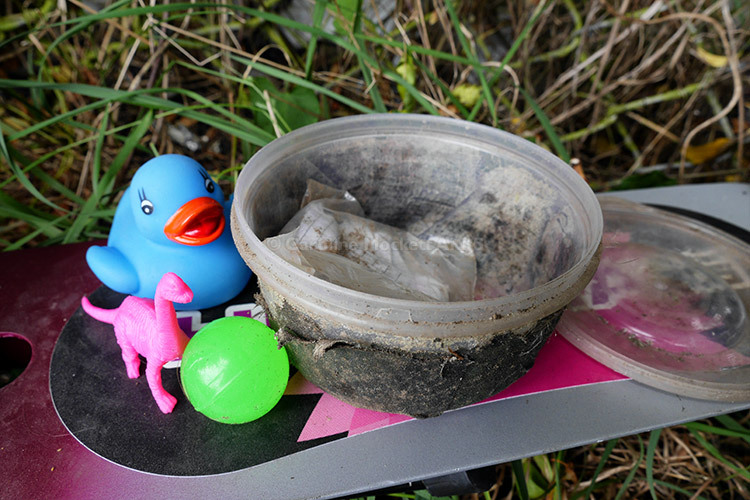 Little Quacker was pleased to find the Really Side Tracked – Maldon West pot, after we had a short search. That’s it, Maldon is done! (Until someone brings out a new one, then we’ll be back). 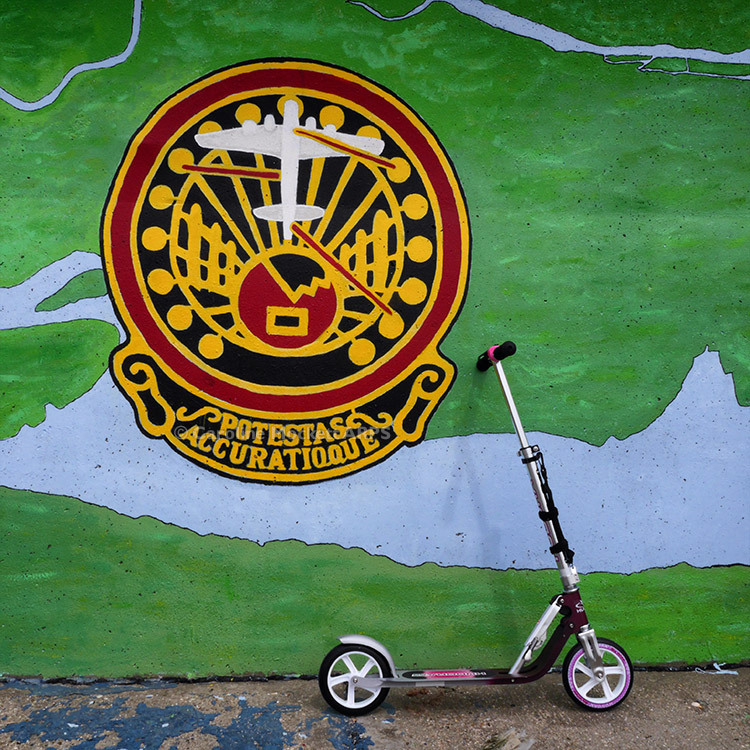 Today I went for a trip around Canvey Island, taking the geo-scooter as I knew it was fairly flat terrain and much quicker to get from cache to cache. My first incident was hitting a rough patch of pavement within about a minute of getting on the thing – and then getting off it again in a very quick, painful manner. Ouch. Bashed my knees up yet again. 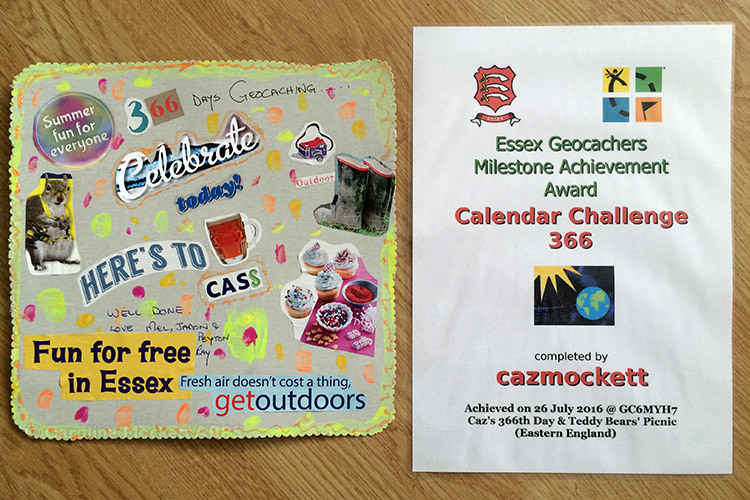 So I hobbled around the Canvey Heights Country Park and started off with two DNF’s – as had others recently. However, the next two were also unfound by previous seekers, so I was pretty happy to have spotted them myself. This one was a tricky little blighter, but we got there in the end! 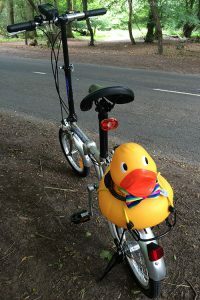 Then I relocated to have a scoot along the Sea Wall and back, picking up the Island Gateway series of hides by G4UYG. I managed to locate all but one (and that was only because GZ was infested with muggles both times I passed, so I couldn’t really look). So apart from the initial mishap, it was an enjoyable outing by scooter. I’m still nursing the bruises and expect I may be a bit sore for a few days to come! 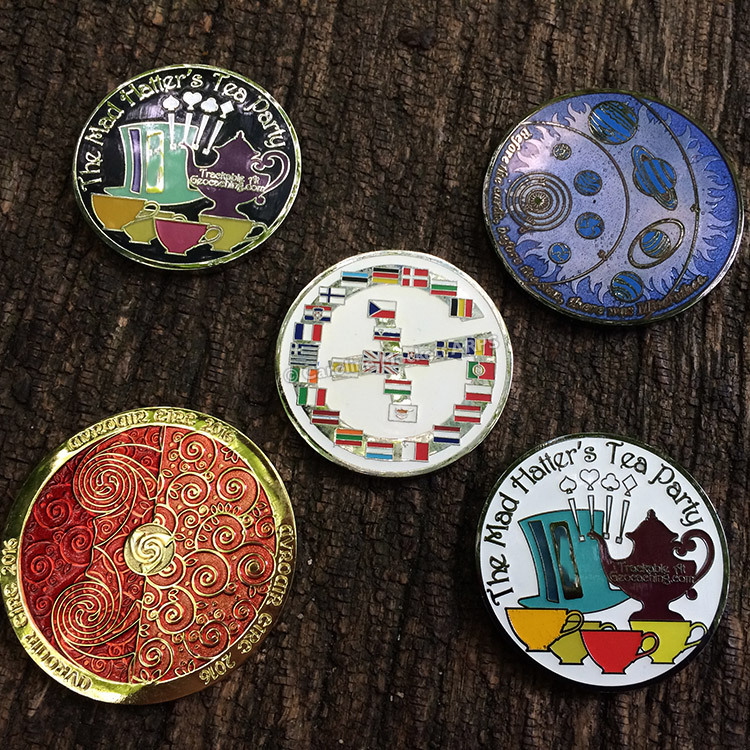 I guess I’ll have to dip my Adventures Coin into the finds as they were definitely out of my comfort zone! Ouch. I was stuck at home working all day, unable to play. But I skipped out a bit early this evening on the way to my friend’s for dinner, and headed to Crays Hill and Noak Bridge to search out handful of caches. With just one DNF, I managed to bag three quickly. Job done. 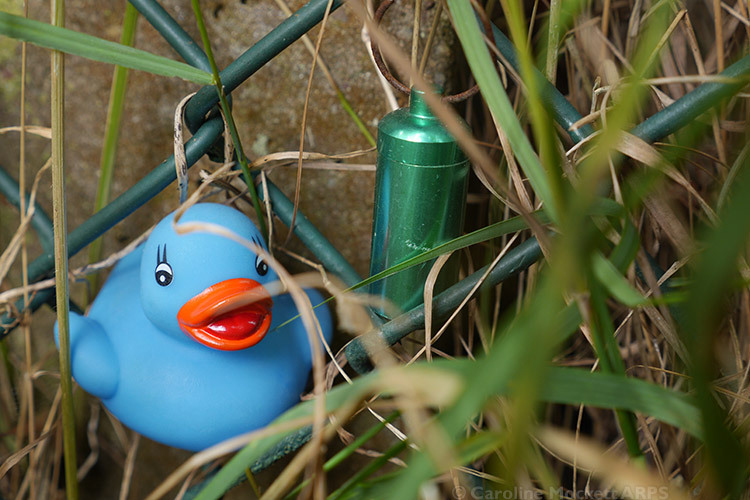 First up was a musical girls’ cache, where Little Quacker was pleased to make the acquaintance of a Mr S. Cargo. 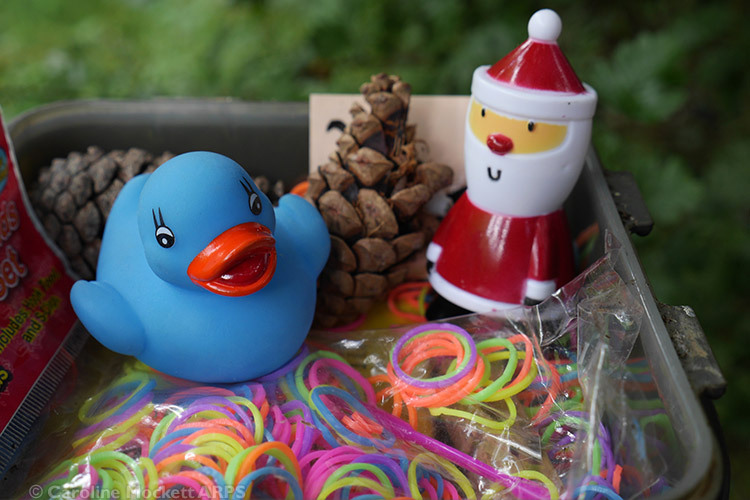 We found an older cache in the little nature reserve at Noak Bridge – LQ was very surprised to see Santa! 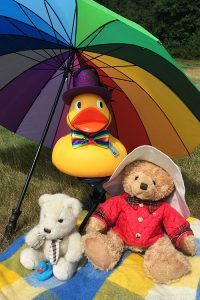 I ordered sunshine for my Teddy Bears’ Picnic Event today and it worked! 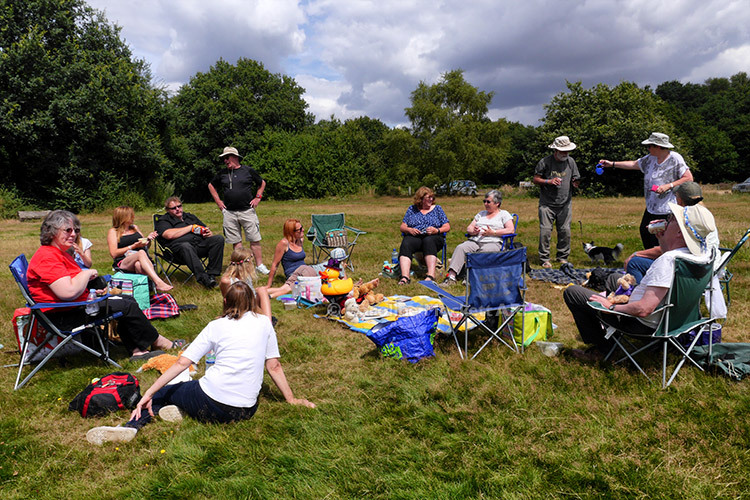 We had lovely weather for my little gathering on Galleywood Common and there was a great turn out. 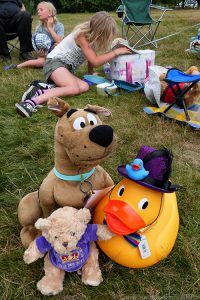 There were plenty of teddies (and other animals!) in attendance, as well as human cachers. it was a nice relaxed way to celebrate my 366 Day geostreak. 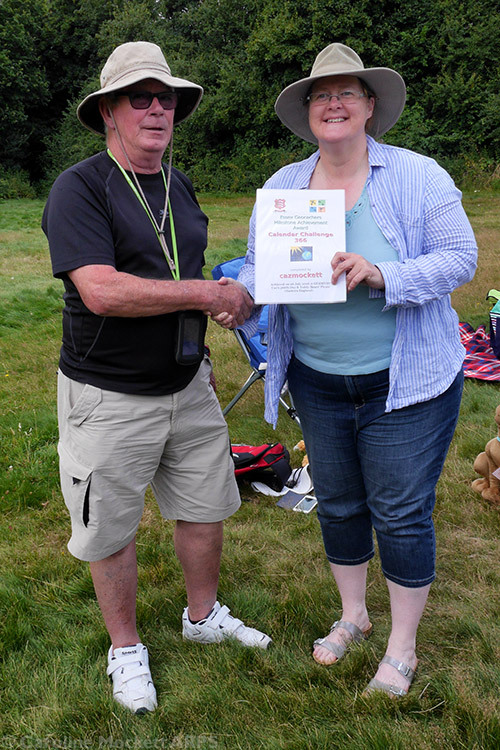 Vanguard3 (Bob, Mr Certificate) presented me with a surprise Essex Cachers achievement award, which was an unexpected bonus! I also got a delightful hand made card from a couple of the younger cachers in attendance, which was very sweet. So, am I giving up now? Well, not quite. I’ve decided to keep going up to 400 days (which should occur on 29th August 2016). That’s a good round number. Keep an eye out here for forthcoming adventures! 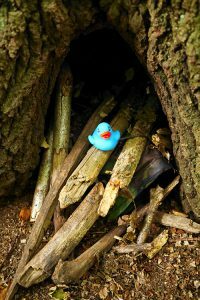 I decided to visit Hockley Woods today to pick up some of the many caches which lurk there. A good few have been there a long time, which would help me along with my pre-March-2012 finds challenge. A couple were also quite tricky, so I was delighted to find the pots where others had failed before me – it’s all too often me who’s staring down the barrel of a DNF! 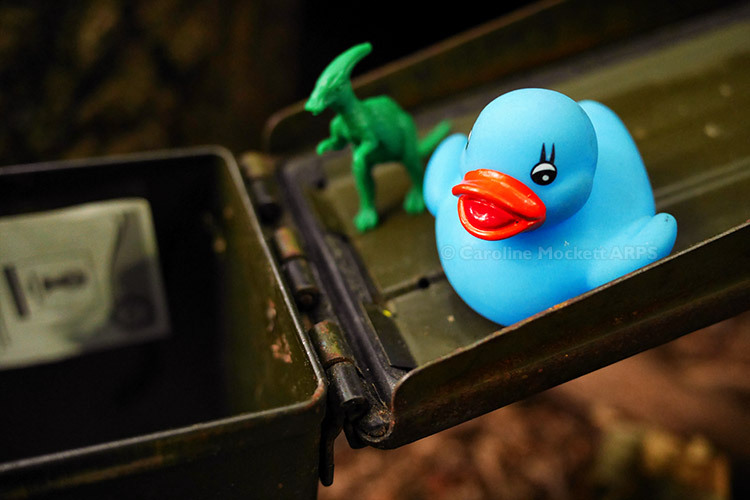 Little Quacker was delighted to find his first Ammo Can too. Plus he got to meet a friendly dinosaur who was guarding it. 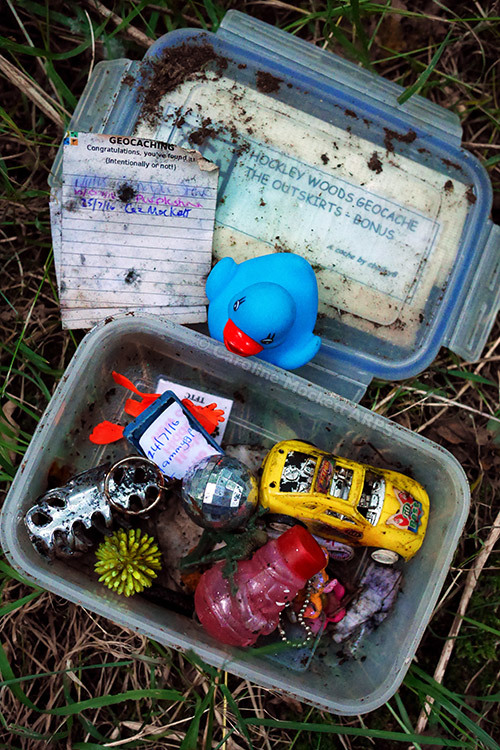 The penultimate find of the day was a box which has been in the wild since November 2009. 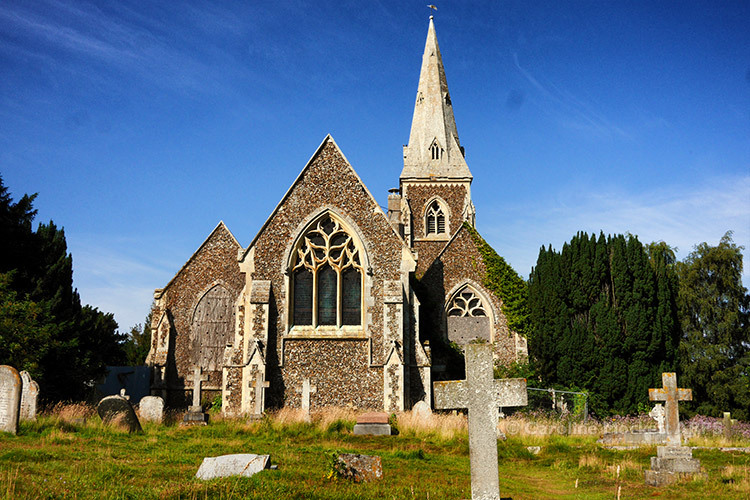 Sadly, it’s looking a bit the worse for wear now and could do with a bit of TLC, but at least it was still there. I went up to London this afternoon to attend the Mad Cachers’ Tea Party event organised jointly by local pan314159 and avroair, who was visiting from the USA. 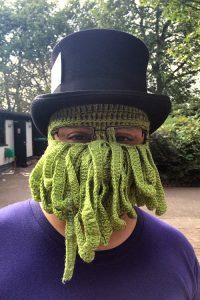 Everyone was encouraged to wear a mad hat – and there were certainly lots to be seen! 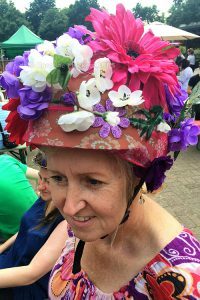 Extraordinary creations were the most fun – there was a popular vote for the best and this bonkers hat was the winner! Even Nemo looks surprised! 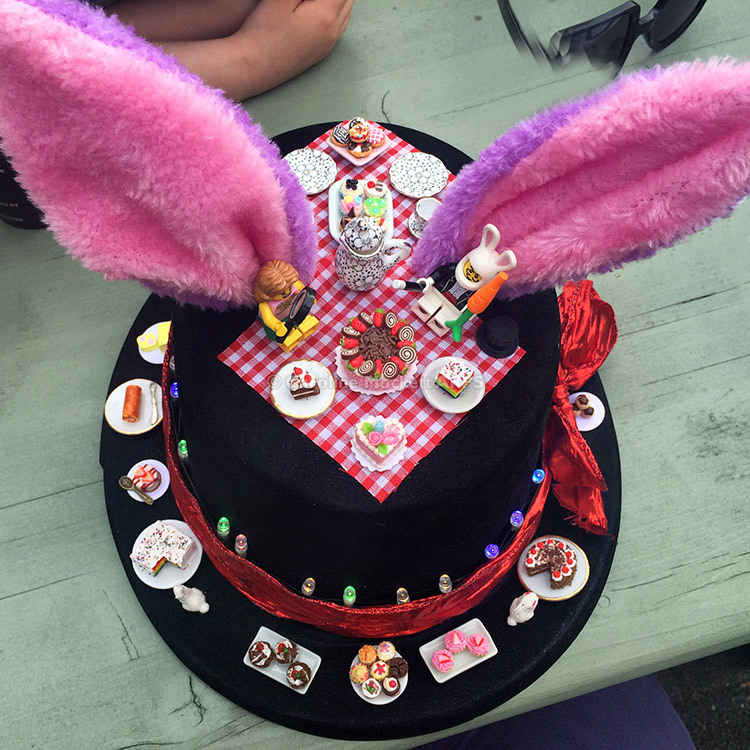 My own creation was not a modest affair – furry bunny ears, LED lights and a full-blown tea party going on around the brim and on top. It turned a few heads. I was glad it survived the journey by train in my picnic bag. 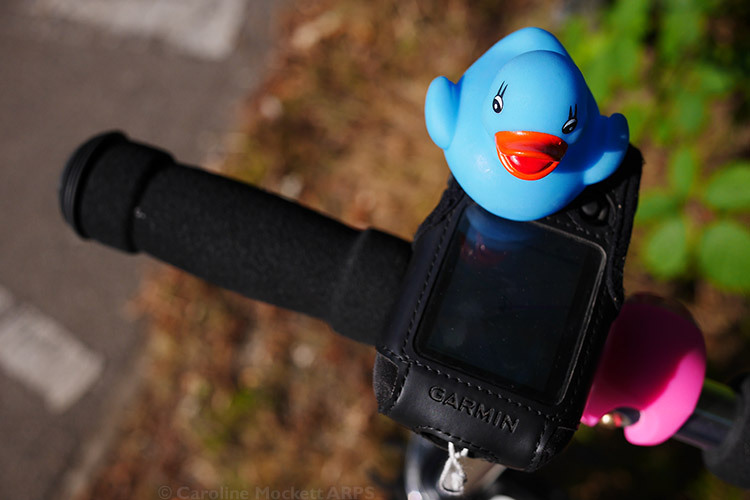 My Little Quacker was delighted to make some new friends who were also taking part in the HQ Duck Dash. I’m sure there was a bit of rivalry going on too! 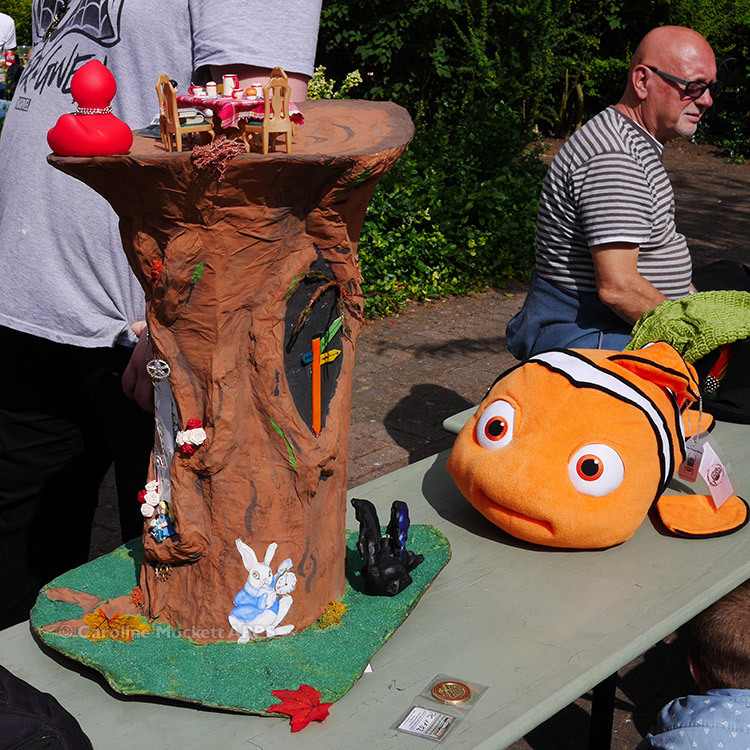 There were many tempting shinies on offer two, as several hard-core coin collectors were there with their duplicates and swaps. I was very weak! As well as the event, I also managed to squeeze in a multi and trad find beforehand, plus another multi and earthcache on the way home. The SideTracked EarthCache – Euston Station Geology cache (also by pan314159) was another one which has been on my London target list for ages. It was still busy this evening, but a little patience eventually paid off and I got the info I needed. Just time for a quick single today, and I needed a Church Micro to complete the Church Micro Date Challenge. I was on my way to Colchester to visit mum and dad for the day, so chose an unfound CM in Birch Green which was worth a short diversion. 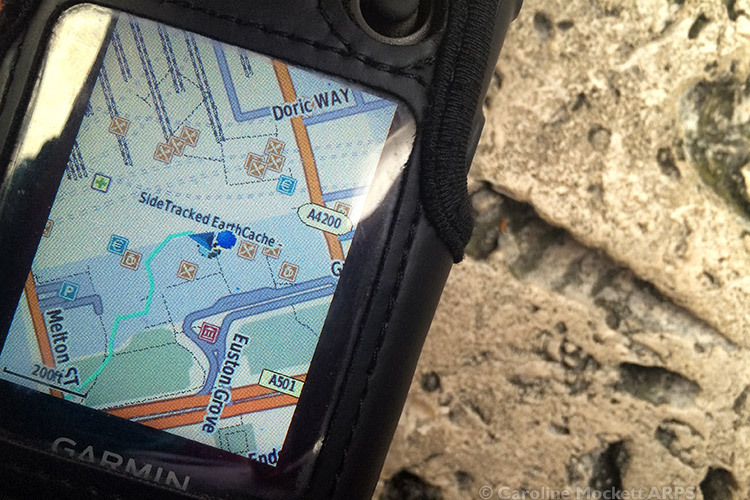 Having parked up and walked to GZ, I found the cache – not quite where the hint suggested, but easy enough. 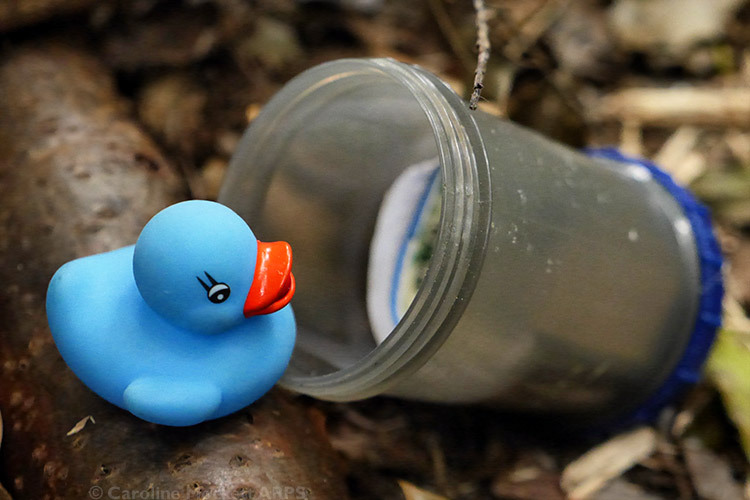 My Little Quacker had brief fun with the yoyo he found inside! This evening’s trip was to Tiptree to try and mop up a few more boxes there which are still outstanding. After finally bagging a very old Church Micro, I scooted off to Simple Command – a keysafe hidden on the back of a Give Way sign. 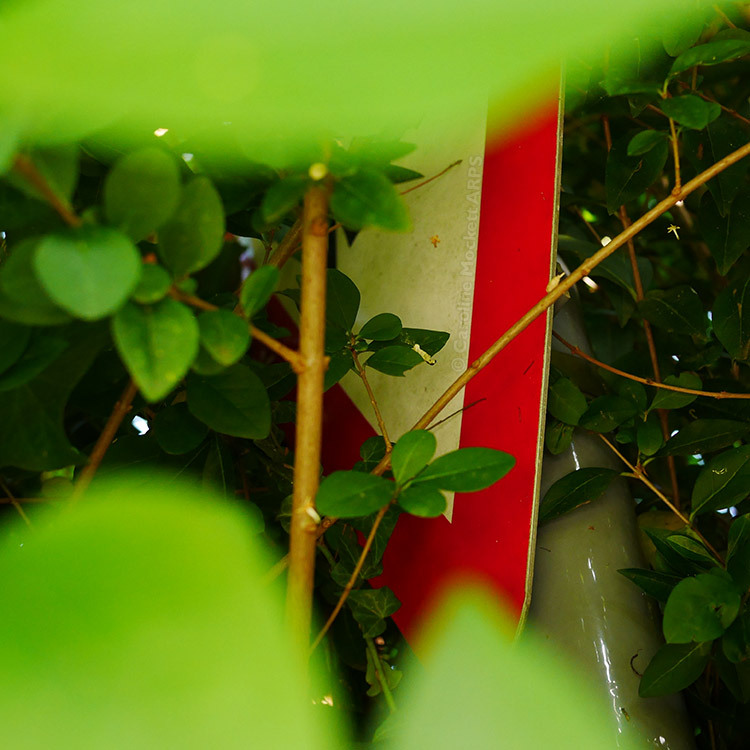 However, finding the sign was the hard bit – it was buried deep in the hedge! Still, I’m used to hedge fiddling in this game, so it didn’t deter me much. We also had to walk some footpaths in the countryside to find a couple of other boxes, but that’s no problem since the scooter folds up easily and isn’t too heavy to carry when not in use. 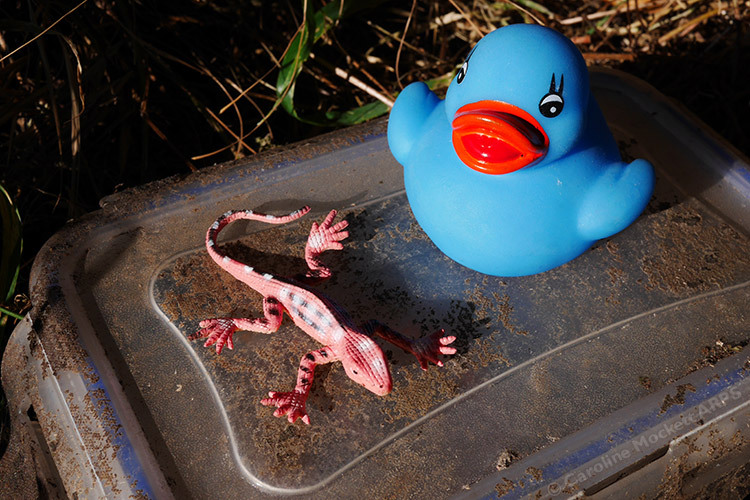 LQ found a little lizard to befriend in the box – he looked quite real but is just as plasticky as the duck! Another enjoyable outing by scooter, which was rounded off by popping in to see Mr Crow on the way home for a welcome cup of tea.